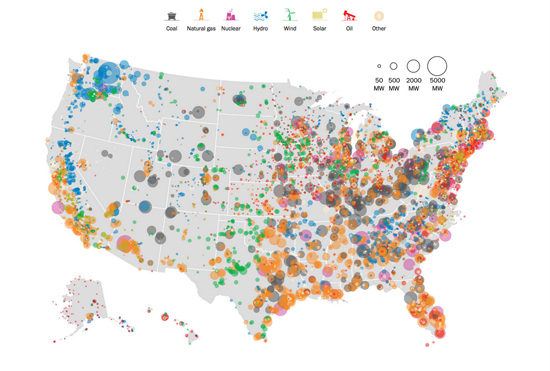 Constructed by The Washington Post, the map in the featured image above lays out every power plant around the country with the accompanying fuel type and power output. Each circle on the map is an individual power station and the corresponding color represents the type of station, while the size denotes power capacity. As you will notice, coal-powered stations are outnumbered by natural gas power stations 511-to-1,740, even though 34 percent of the nation’s power comes from cool.